Sunset on the famous Na Pali Coast of Kauai is a very colorful and magical experience. I loved experimenting with the color for this one!! 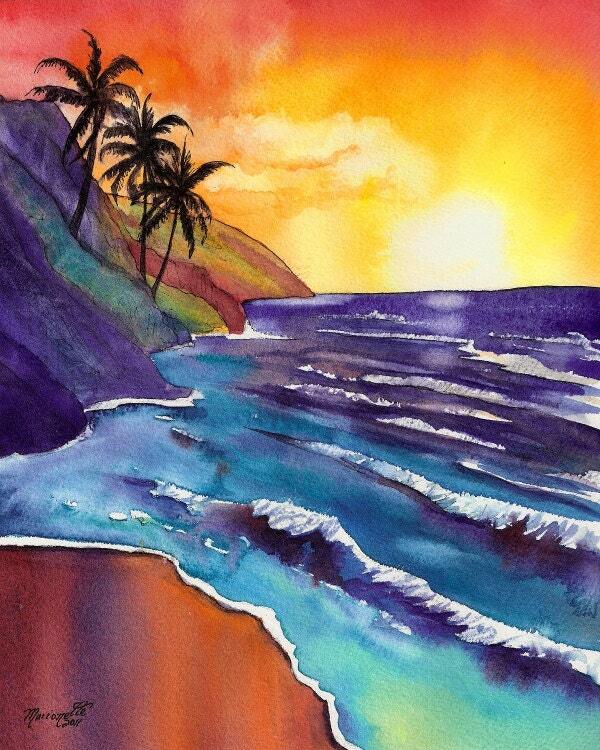 "Na Pali Sunset" This giclee print is signed by the artist and is printed with archival inks on radiant white watercolor paper. It is a reproduction of an original watercolor painting and comes packed in a clear sleeve with a backing board (unframed). Colors may vary slightly from monitor to monitor. I bought 4 paintings from this artist, and they are all beautiful! Great quality, very prompt responses to my questions, and the pieces arrived very quickly with no issues. Five stars all the way, from service to quality. Thank you. Received within a few days of ordering. Beautiful colors. Such a magical place.